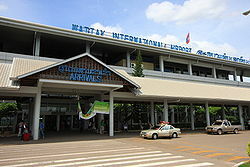 Wattay International Airport (IATA: VTE, ICAO: VLVT) is one of the few international airports in Laos and the country's main international gateway, serving the capital Vientiane, located 3 km (2 mi) outside of the city centre. A larger domestic terminal was constructed in 2018 and connected to the international terminal. There is a Lao Air Force installation at one end of the airport. The airport is in Sikhodtabong District in Vientiane. The head office of the Department of Civil Aviation is on the airport property. The head office of Lao Air is on the airport property. Lao Airlines is revising flying to Yangon. The largest airplane that is flown to Vientiane is the A330. This is flown by Thai Airways. The largest airplane that has ever visited this airport is the Boeing 747-400, carrying Park Geun-hye – then-president of South Korea – for the 2016 ASEAN summit. The interior of Wattay Airport in Vientiane. The airport has a bonded warehouse building for air cargo passing through the airport. The facility is operated by Lao-Japan Airport Terminal Building Service Co. Ltd.
Access to airport by shuttle bus, taxi, car and tuk-tuk. A taxi rank is located outside the main arrival hall. The shuttle bus stop is located outside the international terminal. On 24 March 1976, Douglas C-47A Skytrain XW-TAF and C-47Bs XW-TDF and XW-TDR of Royal Air Lao were damaged beyond economic repair in a storm. On 16 October 2013, Lao Airlines Flight 301 crashed on approach to Pakse International Airport from Vientiane. All 49 aboard died. ^ "Contact Lao Central Airines." [sic] (Archive) Lao Central Airlines. Retrieved on 21 October 2013. "International Airport, Ban Arkard, Sikhodtabong District, Vientiane Lao PDR"
^ "Laos" (Archive). Federal Aviation Administration. p. 2/10. "Ministry of Public Works and Transport Department of Civil Aviation Vientiane/Wattay International Airport P.O. Box 119 Vientiane, Lao PDR." ^ "Contact Us." Lao Air. Retrieved on 19 September 2010. "Lao Air Company Asiane Road, Ban Akat, Wattay Airport"
^ "Hainan Airlines adds Shenzhen – Laos links from Oct 2017". routesonline. Retrieved 31 October 2017. ^ 2018, UBM (UK) Ltd. "Lao Airlines adds Vientiane – Chengdu from late-June 2018". Retrieved 24 July 2018. ^ 2018, UBM (UK) Ltd. "Sichuan Airlines adds new Laos route from May 2017". Retrieved 24 July 2018. ^ "Scoot Starts Sale Of Singapore-Laos Flights" (PDF). cdn.flyscoot.com. Retrieved 10 January 2019. ^ "XW-TAF Accident description". Aviation Safety Network. Retrieved 15 August 2010. ^ "XW-TDF Accident description". Aviation Safety Network. Retrieved 15 August 2010. ^ "XW-TDR Accident description". Aviation Safety Network. Retrieved 15 August 2010. Airport information for VLVT at World Aero Data. Data current as of October 2006. This page was last edited on 19 April 2019, at 05:02 (UTC).